What's that building? 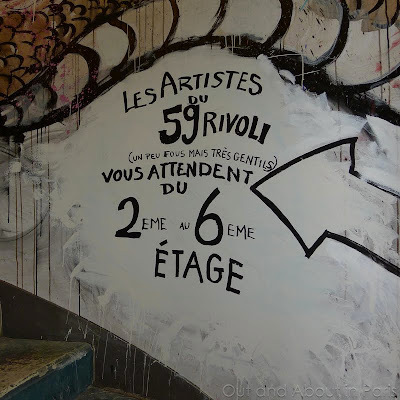 The art squat at 59 Rue de Rivoli! "So, what do you think that building is over there?" I overhear that question a lot in Paris. It's bound to happen whenever I'm walking behind a slow moving group of people or standing at a red light waiting to cross the street. Even though it's invariably asked in a booming voice and seems to be addressed to the world in general, I usually try to restrain myself from answering by clamping both hands firmly over my mouth because past experience has shown that the interrogator doesn't really expect a response. 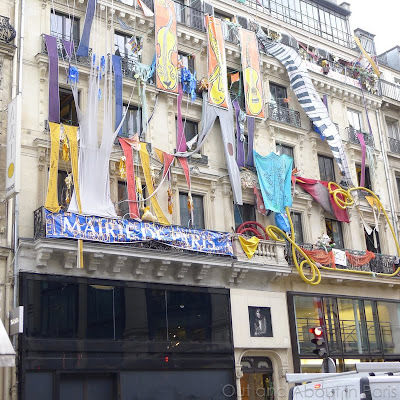 But when I recently overheard an Australian couple talking about the "strange" building in front of us on Rue de Rivoli, I threw caution to the wind and told them that it's a legal art squat and well worth a visit. After studying me for a minute to make sure that I wasn't a scam artist or deranged (depending on the day I tend to look like one or the other), they decided to venture inside and take a look at some of the most progressive art in Paris. 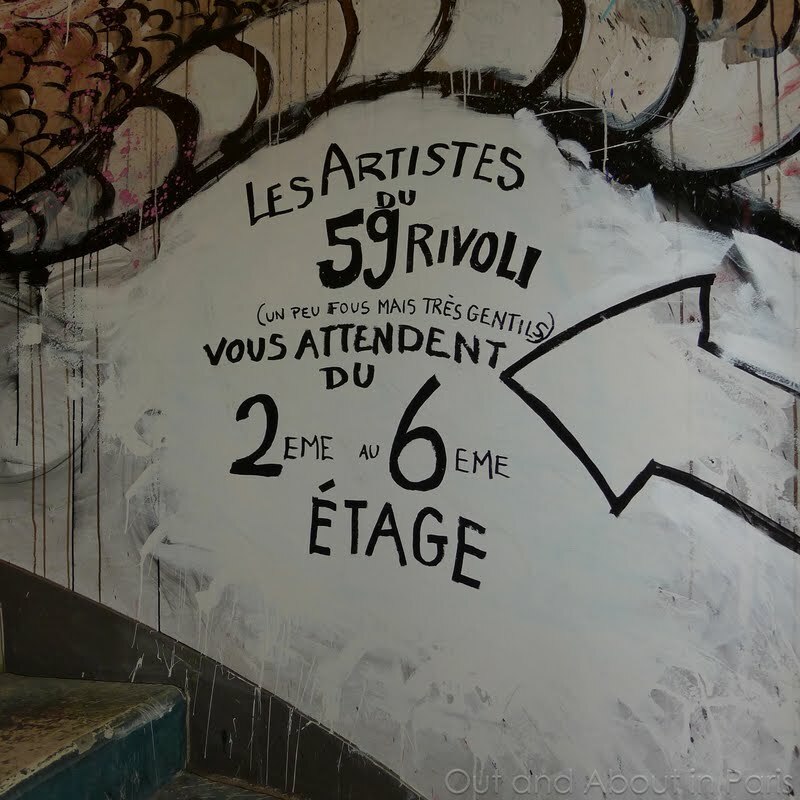 The artists of 59 Rivoli (a little bit crazy but very nice) wait for you on the 2nd to 6th floors. 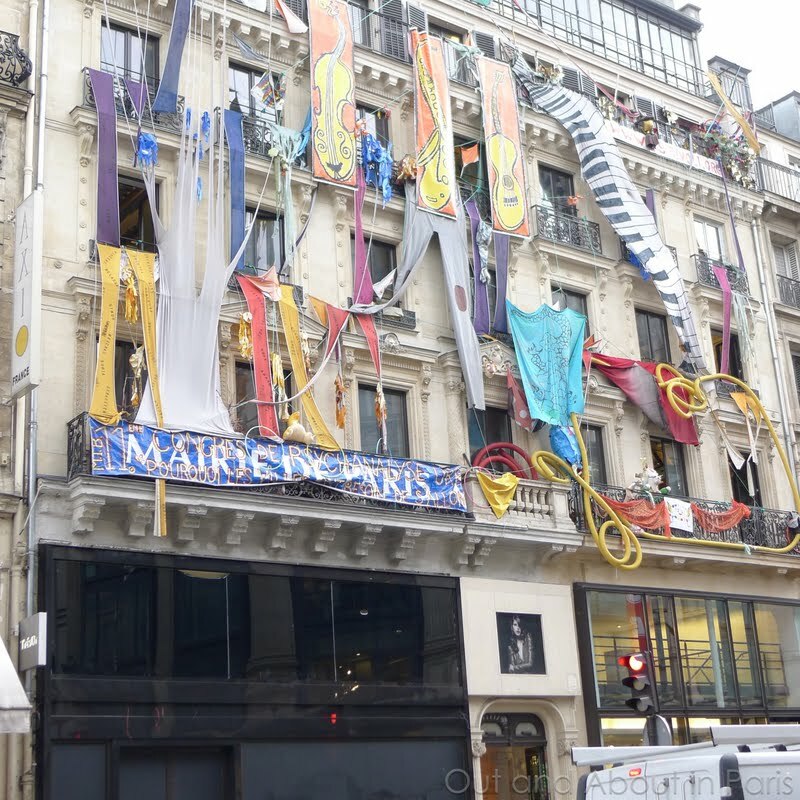 When the building at 59 rue de Rivoli was abandoned by Crédit Lyonnais and the French state, a group of artists took possession of the premises and turned it into a space where more than 30 artists create, store and display their paintings and installations. As most of the artists have signs prohibiting photos of their edgy and innovative works, I'm only posting pictures of the stairwell and the facade of the building. You'll have to visit the art squat to admire their creations. Who knows, maybe you'll find something that was painted by the next Monet or Matisse! And better yet, you'll be able to answer the question, "What's that building?" Mary Kay: Great post...another one of those I meant to do but somehow never got around to. Thanks for helping me experience Paris from afar! Thanks, Anne! Sorry that you missed the art squat while you were in Paris. It's a funky and unique place. My son and I had a great time looking at one of the artist's paintings that were a play on French words or names. He's still laughing about the painting "YSL - Yves sent Laurent". I'll leave the rest to your imagination. There were also some very interesting pieces by a Japanese artist who used metro tickets to make pictures and origami. Very unique. What else was on your list of things to do in Paris? I'm always open to suggestions! "Push open the door"--almost a line from Lewis Carroll. The adventure awaits, but so often we fear what's beyond the door. I am often stopped on the street, in PARIS, and asked for directions, usually in French! My French is college-forgotten, and I usually just reply in English and pull out my map to aid the person. 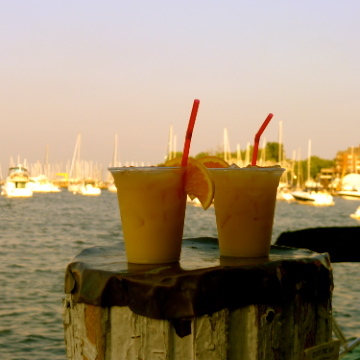 And when I over hear someone on the streets here in Chicago sounding lost or misdirected, I often just interject myself into the scene--I love giving directions, tips and guidance. "Oh, you want to go this way, and be sure to see this...."
You must have that French flair, Joseph, that they're asking for directions in French! I like helping people, too, which is what usually gets me in trouble because some tourists are unpleasantly surprised to discover that there's an English speaking person (me) standing behind them when they say something like "What's that building?" That's why I usually try to keep my mouth shut, although it's difficult! Nonetheless, I continue to "push open a lot of doors" in Paris. What's your favorite book about Paris? Out of Paris - Can you guess where I am? La rentrée - My first day back in Paris! Hot on the trail of apples! Why are there rose bushes in vineyards?